Nonprofit helps transform lives one table at a time. 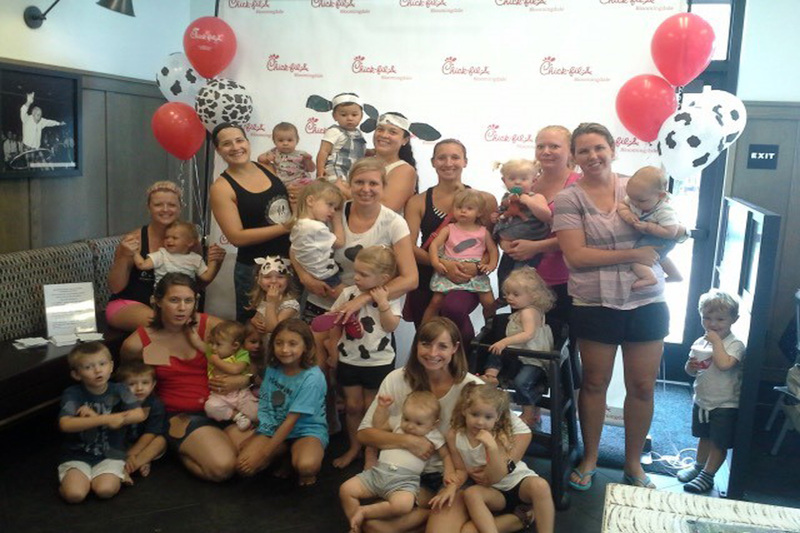 On most Wednesdays, a dozen moms and twice as many small children meet at the Chick-fil-A Bloomingdale in suburban Chicago around 10:45 a.m. The moms place their orders at the counter while the kids fidget with excitement at their seats. They want to run to the play area immediately, but they know they have to eat their lunch first. For the next couple of hours, the dining room is buzzing with activity. The kids bounce between their seats and the play area while the moms sit around the dining room’s large family-style table and catch up. Nicole Fraser and Kristen Knobloch began organizing weekly get-togethers at this restaurant more than a year ago. As the owners of Fit4Mom Bartlett-Barrington, a franchise offering fitness classes for moms, Fraser and Knobloch wanted a family-friendly place to go after their Wednesday morning classes. Chick-fil-A’s new restaurants are especially well-designed for this type of gathering. In the middle of each dining room sits a handcrafted, pinewood table that can easily seat larger groups, like the moms of Fit4Moms. These rustic tables can currently be found in 381 Chick-fil-A restaurants across the country, but each one is made from scratch in Peachtree City, Ga. And each one tells its own story. John Barrow wastes no words when describing his upbringing in New York. Eventually, Barrow’s lifestyle caught up with him, and he was sent to prison. 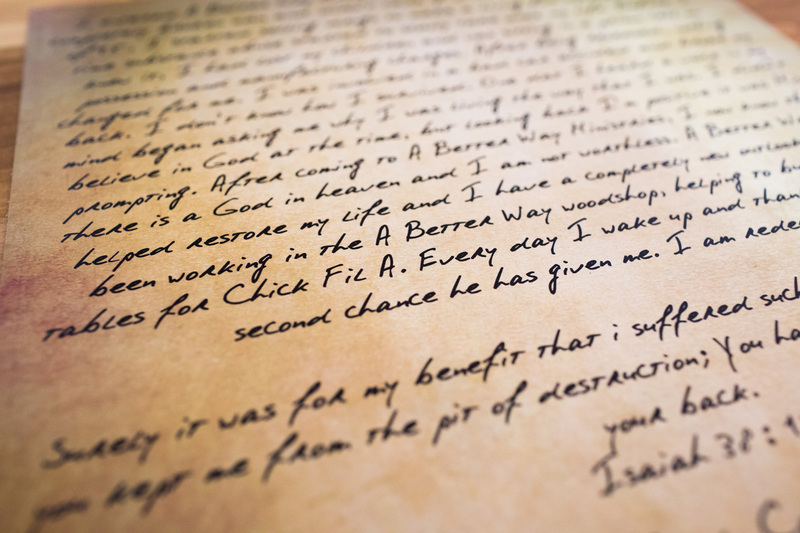 It was behind bars that he began turning his life around. He started reading the Bible and learned masonry. Following his release, Barrow started his own masonry business, eventually expanding into general contracting. By the early 2000s, Barrow’s business was doing well, and a conviction to make the most of his gifts led him to purchase 50 acres in the small town of Senoia, Ga., located 35 miles south of Atlanta. His goal was to create a program that would help others who were struggling with addiction. “It always weighed on my heart to give back and see how I could make a difference with other guys,” he said. Barrow called his organization A Better Way Ministries, which started in 2005 in a 1,500-square-foot farmhouse. Far more than a rehab center, it’s a place where men live, work and study together with the goal of transforming their lives and overcoming addiction. In a little more than 10 years, the program has outgrown that farmhouse in Senoia. Its campus, now located in nearby Peachtree City, Ga., contains six homes and 14 apartments for its 100 residents, as well as a 10,000-square-foot multipurpose facility. 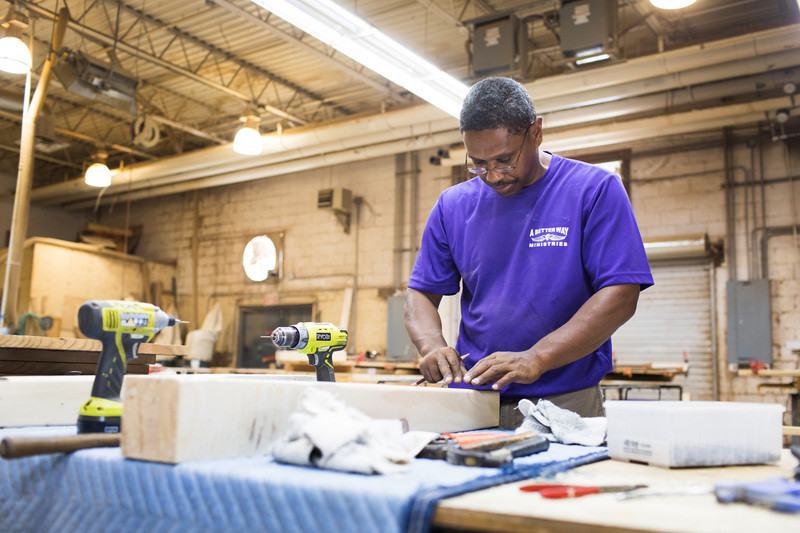 A Better Way Ministries supports its mission primarily with income from a moving company, a thrift store and a table-making business, all of which are operated by program residents. It was one of their tables that caught the attention of Chick-fil-A CEO Dan Cathy at a small store in downtown Senoia. Around the same time, Chick-fil-A was revisiting the look and feel of its restaurants. The company wanted a signature element in the restaurant that created a more authentic feel to the restaurant. A larger table was the perfect fit. “We wanted meaning behind every element,” said Alison O’Rourke, senior manager of restaurant design innovation at Chick-fil-A. Chick-fil-A liked the tables so much that they decided to source tables for all their new restaurants from A Better Way Ministries. This decision was not without its challenges. The organization had not been making the tables for very long and was still honing its process. There was also the challenge of scaling up from creating 30 tables per year to the more than 100 tables that Chick-fil-A would need each year for its new restaurants. But Barrow’s team overcame those obstacles, and the tables can now be found in restaurants nationwide. 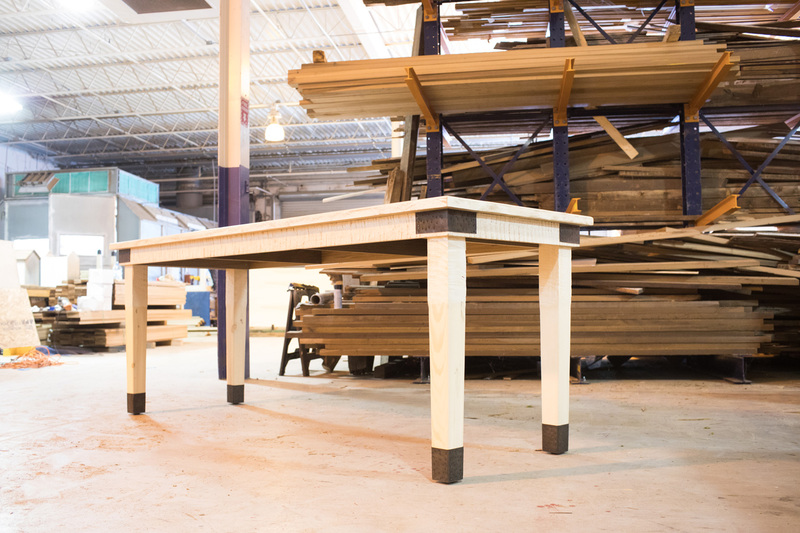 One of the most notable features of these custom-made tables is not something that is visible to most people. On the underside of each table is a plaque with an inscription that tells the story of one of the men who made the table. This testimony creates a connection between restaurant patrons and the table makers. “A lot of these guys come into our program with the deck stacked against them, and it’s amazing to watch the transformation once you show them another way to live,” Barrow said. These tables serve as a physical reminder of the transformation hundreds of men have experienced through A Better Way Ministries. Back at Chick-fil-A Bloomingdale, the moms and their children begin leaving once the lunch rush starts picking up. They will be back next week after class and look forward to continuing to strengthen their own community.